Diamond segment used for core bits to drill ceramic, marble, granite, concrete, reinforced concrete. Diamond segment welded on the gang saw used to cut marble granite and other stones. 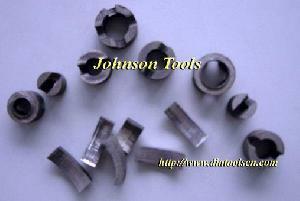 We, Johnson Tools Mfg.Co.Ltd， is professional manufacturer of diamond tools which used in stone and construction industries, such as marble, granite, sandstone, limestone, basalt, grit stone, concrete, reinforced concrete and asphalt, etc.) in China, we have seven years successful exporting experience and 100 percent of our products are exported to worldwide (Euro, USA, Australia, Yemen, Iran, PK, India, etc.). Our main products: 1. Laser welded saw blade ( Size from 105-1200mm, especially 700-1200mm laser wall saw blade and laser floor saw blade) 2. Sintered saw blade (Segment type, Continuous rim type, Turbo type, concave type saw blade). 3. Tuck point blade (Normal type, crack chasing type, two or three layers tuck point blade). 4. Diamond segments. 5. Diamond polishing and grinding products. 6. Vacuum brazed products. 7. Cup wheel (Single row, Double row, Turbo type.)8. Diamond core bits.